To most of us, Steve Nash‘s first appearance in a Los Angeles Lakers uniform was pretty jarring. But to the fine Angelinos that have gone a miserable 24.5 months without a Lakers championship, his presence brings a needed salve. 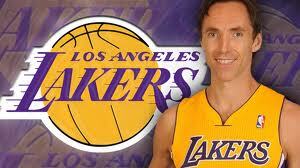 And as such, For Their Conquering Hero, Angelinos must bring Steve Nash the finest ale in the land. Or, failing that, the finest ale they have on hand. Even if it is a Keystone Light.